In an effort to make an access to Tibet easier Chinese Ministry of Railway have completed construction of the Qinghai-Tibet Railway. 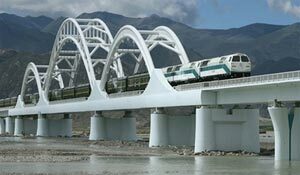 The rail line connects Lhasa (Tibet) with Six Chinese cities namely Beijing, Shanghai, Guangzhou, Chengdu, Xining and Lanzhou. The first train set off from Beijing to cover 48 hours journey on 1st July 06 and reached Lhasa on 3rd July darting across several high passes, the highest being Tanggula pass at 5,072 meter. The world’s highest railway line boasts high-tech engineering and luxurious pressurized train cars are used to help passengers cope with high altitude. Explore Himalaya in coordination with its regional partners in all train departing cities can buy train ticket to / from Lhasa and have it delivered to you along with your Tibet Travel permit if you buy the tickets together with our Tibet tour packages. We are not able to sell Train ticket only due to various Chinese travel regulations.